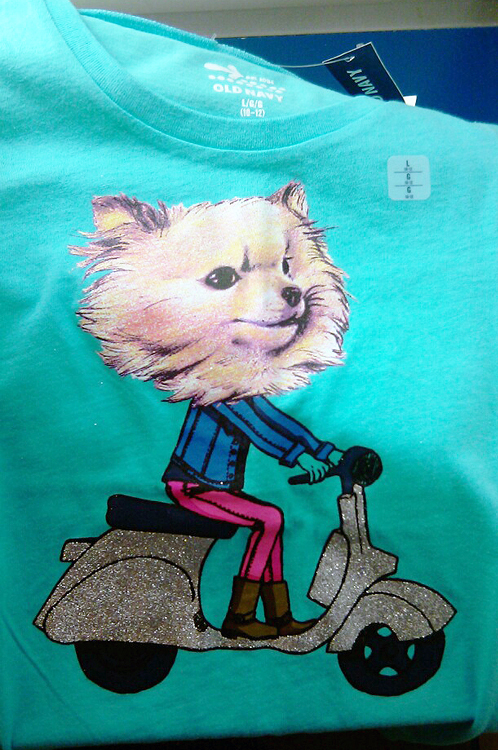 While you’re busy stocking up on scooter riding monkey pjs at Old Navy (see today’s other post), why not also keep a look out for this mod Pomeranian riding a sparkly Vespa? Comes in girls sizes 5-14. Sorry but I can’t find it for sale online. What is going on with kids’ clothing this year? Are they purposely trying to drive us adult scooter fans nuts? I want to wear some of these shirts for Pete’s sake! For the squeee factor I present a Baby Gap shirt for $19.95 that comes in sizes for 12 mos to 5 years. It’s off-white and 100% cotton. It looks incredibly similar to a design that Baby Gap did awhile back featured here. But there’s nothing wrong with recycling. Thanks to brand new contributor Louisa L. for the photo and the find! 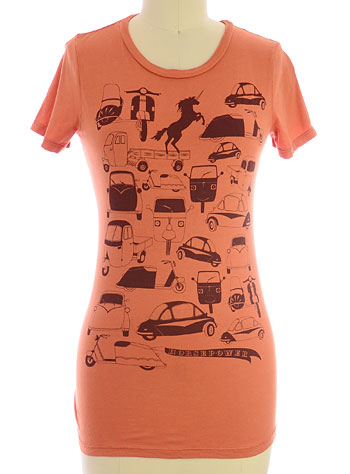 Here is a new, very attractive shirt from women’s motorcycle gear specialist Vavavroom’s “Classic Rides” collection. 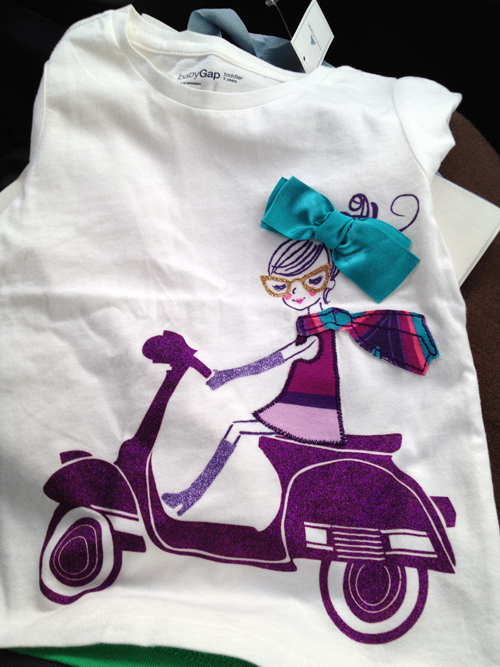 It’s made out of soft “burnout” cotton and features a Lambretta â€” just in time for Lammy Jammy. It’s available in sizes S-2 XL and is $34.99. 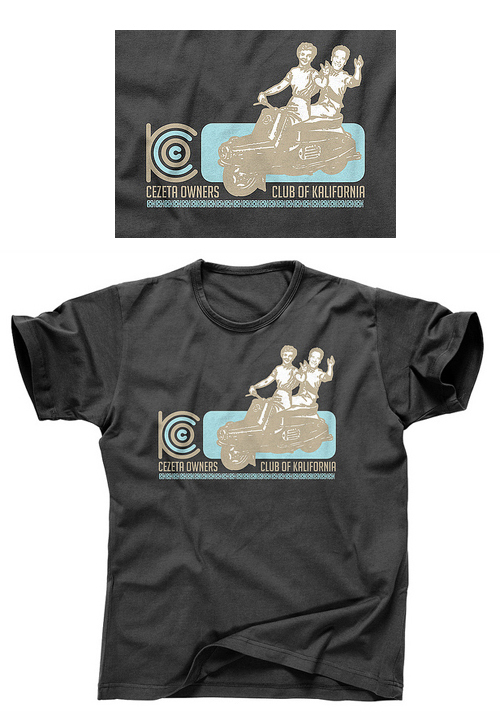 Thanks to Denise M. from Vavavroom for letting us know about this new shirt! 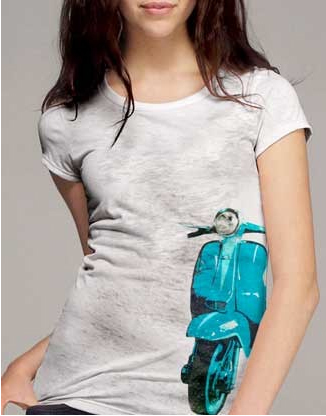 This t-shirt is still on Paul Frank’s site but it’s out of stock. I would add it to your wish list on the site and maybe you will get an e-mail if it becomes available again? I especially love the little mod target on the back shoulder with the arrows coming out of it. The price is listed at $22.